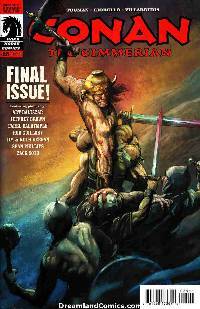 The thrilling, battle-filled finale to Robert E. Howard's "Iron Shadows in the Moon"-and Dark Horse's final Conan the Cimmerian issue! With the threat of pirates and a centuries-old evil at his heels, Conan's troubles triple when he and Olivia are confronted by the jungle creature that's been stalking them. The island where Conan once sought refuge has become a battleground with constant surprises and death in every dark corner. Tim Truman, Tomás Giorello, and José Villarrubia conclude their adaptation of one of Howard's strangest stories in their final issue of Conan the Cimmerian. Fear not, faithful readers, as this Conan creative team will be returning next year to chronicle the exploits, adventures, and woes of an older King Conan!